I had a little fun with this beautiful creature, imparting human qualities upon its regal form. I thought if elephants were people they might become a tad self-concious after watching, The Biggest Loser. 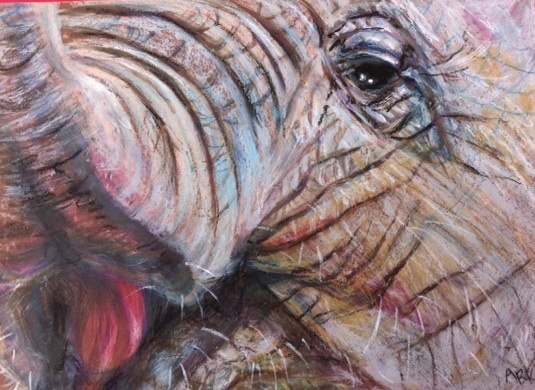 This entry was posted in Can't put Anywhere Else, My Art & Writing and tagged art, beauty, elephants, friends, humor, inspiration, overweight, wildlife. Bookmark the permalink. Hey, you’re supposed to be chilling with the recuperating pooch 🙂 Did I miss a post about your mom-in-law’s passing – I’m sorry for your loss. You and Oklahoma again huh? Love your creations. Thanks for the up-thumb, it’s truly appreciated. I have a long way to go with where I’d like to be artistically and sharing is great incentive to keep improving.